A day exploring New York City usually conjures up images of gazing out over twinkling lights from the Empire State building, amazing hotels, and dining luxuriously at one of the many Zagat rated restaurants that are found all over this incredible city, sipping wine while looking out on to bustling streets. 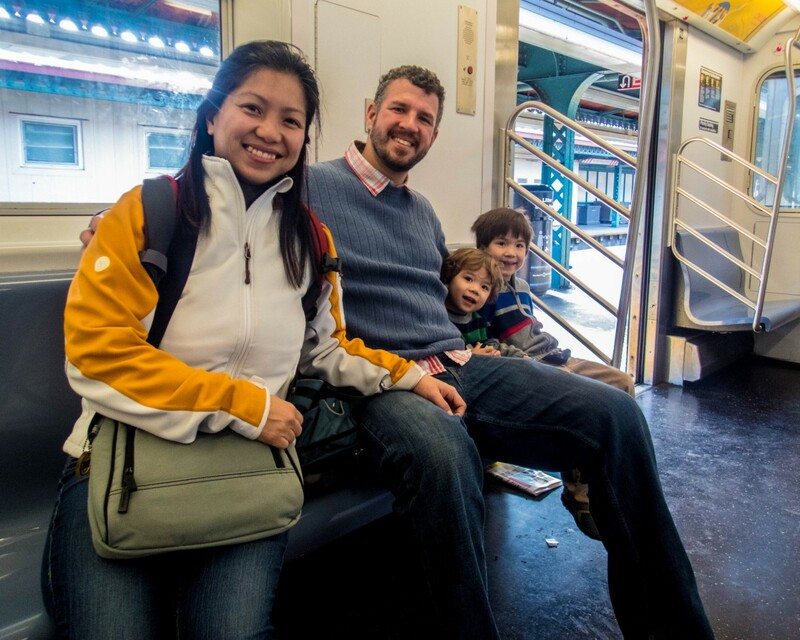 New York City is a regular destination for our family, sometimes visiting several times per year. However, we never before made it our goal of tasting the creations of New York’s finest chefs. This year was going to be different, this year we were going on a New York City food tour! In true Wandering Wagars style however, there had to be catch, and this one would be to have the kids pick out which places we would eat based on a list of the coolest places we could find. Did they choose to head to midtown to eat seafood at the Le Bernerdin, which snagged Zagat’s coveted number 1 spot for Best New York City restaurant for the seventh year in a row and also garnered 3 stars from Michelin? Or did we eat at Daniel, voted TripAdvisor’s best New York City restaurant in 2015? Nope. 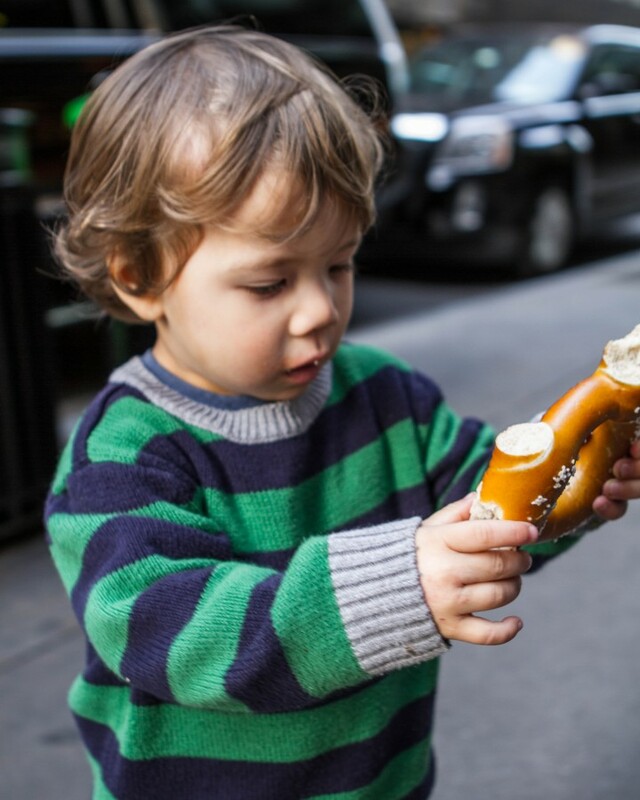 Though there is a seemingly endless list of scrumptious fine dining experiences that we would have loved to visit for our foodie tour of New York, our children picked some interesting alternatives instead. Since none of the New York food tours offered exactly what the boys were looking for, they decided to make our own NYC foodie tour. Let’s see how they did! We are lucky to have wonderful relatives living just outside of the city who graciously host us whenever we are visiting. We were dropped off the subway station so we could take the #4 train to Grand Central Station. With over 30 lines, with a seemingly endless combination of connections, calling the New York City subway system intimidating may seem like an understatement (Toronto, near our home, has a whopping three lines). Maps, however, are available for free at the ticket booth and are very handy. NYC ticket agents have also been great to us, including on this trip when the agent patiently answered all my questions, even while C and D were doing their best to climb into the ticket booth. To begin our journey on the subway we purchased a MetroCard. A single ride costs $3.00 USD. It is possible to purchase unlimited day passes, however because of how we mapped out our day the pay per ride option offered the best bang for the buck. 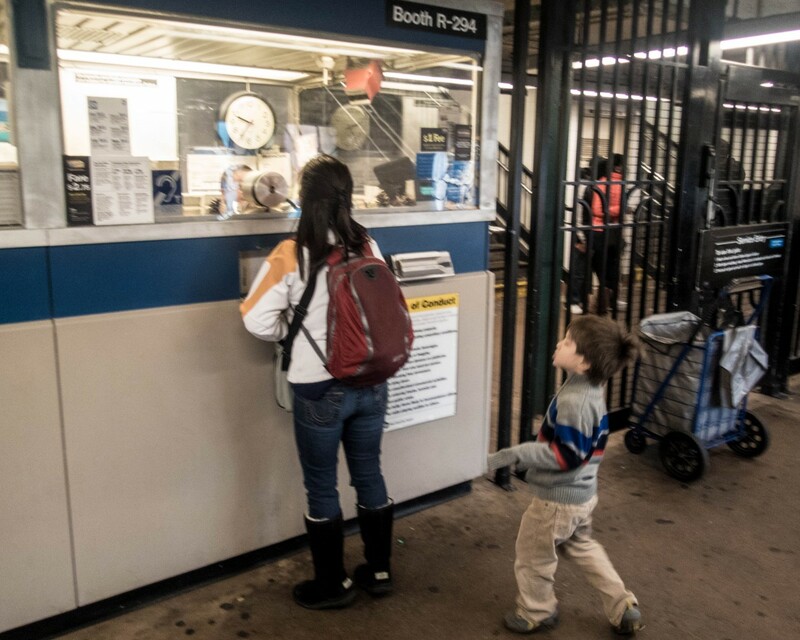 MetroCards can easily be reloaded using cash or credit at machines found at subway stations. 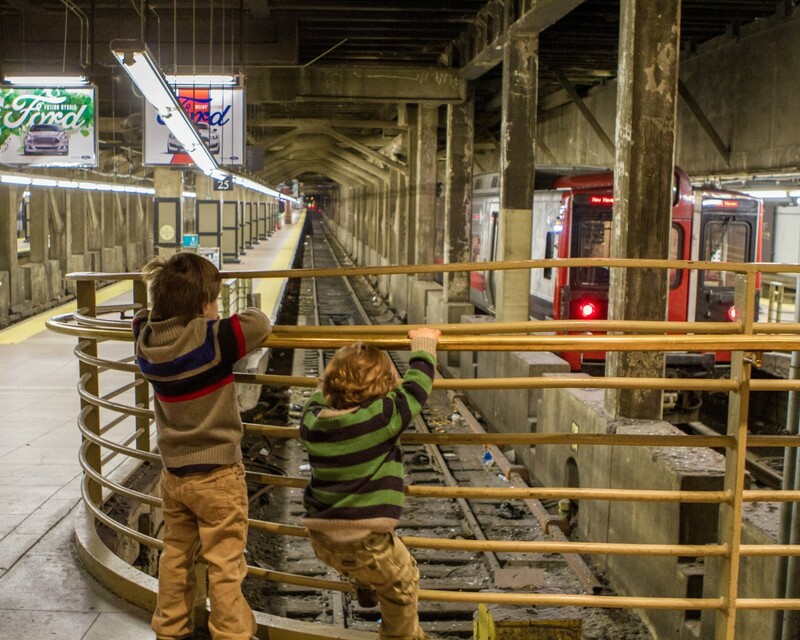 The kids were so excited about their ride on the subway. They divided their time equally between having their faces glued to the windows to watch the scenery and entertaining their fellow passengers. Once we arrived at the station however, the fun of wrangling two children who are used to running wild began. We wrestled them up to the main concourse of Grand Central Station (also referred to as Grand Central Terminal). Pro-Tip: Grand Central is called grand for a reason. Make sure to keep an eye out on little ones. There are many distractions and kids can easily get lost in the crowd. When we visited, there were armed guards at the various exits. We told our kids that if they ever got lost, they should approach one of the soldiers to ask for help. With over 20 million visitors a year, it was easy to see why this is one of the most visited tourist sites in New York City. Grand Central covers 48 acres and has 44 platforms, the most platforms of any railway station in the world. The main concourse is at the center of the station and measures 84 m long by 37 m wide and is 38 m high. It’s easy to do a self-guided tour of the station with a guidebook, but for those that feel inclined, daily tours are available along with audio guides. As soon as we stepped out of Grand Central Station, both C and D were instantly ravenous and ready for their first foodie tour stop: Their first choice was a true, New York City dining staple, the quintessential New York City street hot dog. 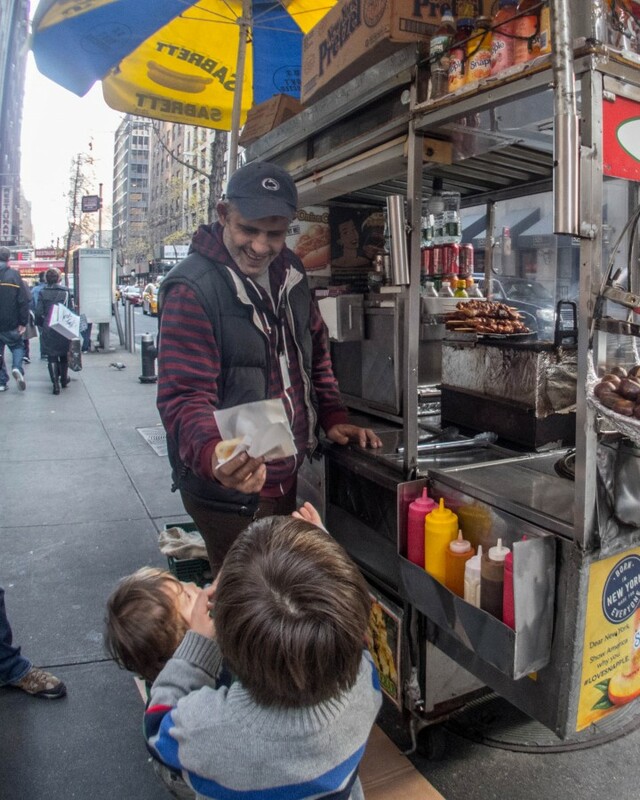 Lucky for us, there are a number of hot dog stands just outside Grand Central. No stop at a hot dog vendor stand is complete however, without also grabbing one of the fresh, soft, salted, pretzels. Hot dog stands are in abundance along all the major tourist sites and most of them also sell pretzels. Some of the best street food in the world can be had in New York City and at $3/hot dog and $2/pretzel, while far from healthy, they are definitely a bargain. 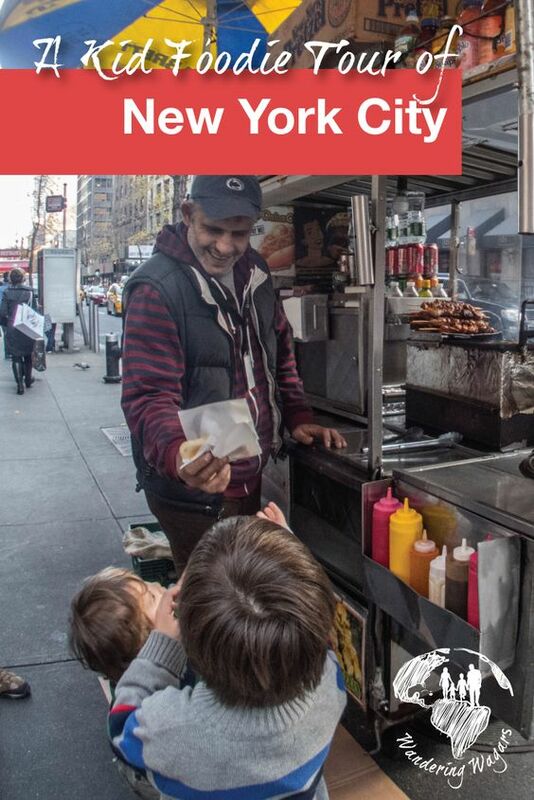 Hot dog vendors in New York City pay anywhere from $100,000 – $200,000/year for a license to sell their food on the street. That’s a lot of hot dogs and pretzels that need to be consumed to turn a profit. With our bellies full, off we decided to build up our appetite for our next stop a the iconic New York City Times Square. Also known as the crossroads of the world, Times Square is visited by approximately 42 million people a year making it the world’s most visited tourist attraction. Lined with absolutely massive multimedia billboards, Times Square is a mecca of advertising. 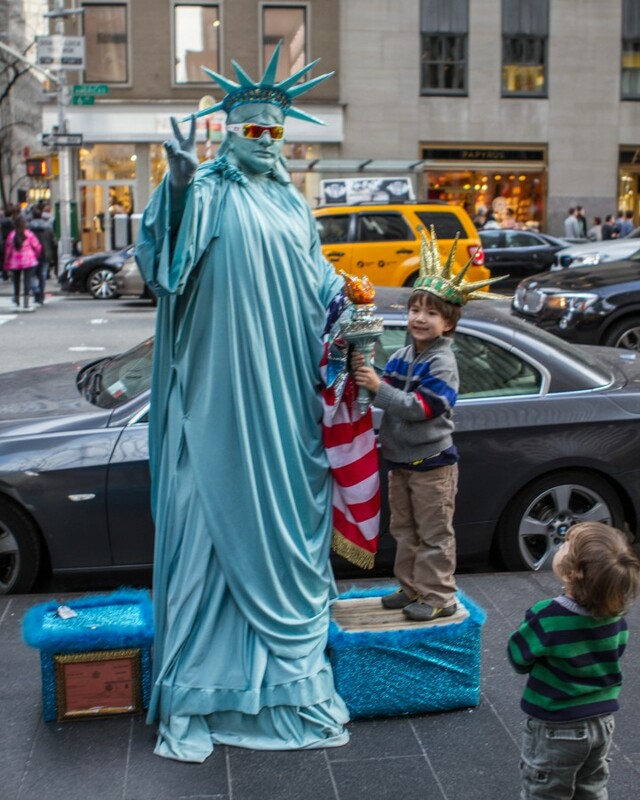 Flashing lights, blinking everything, nothing is too gaudy for Times Square and it had the children absolutely mesmerized! Street-performers lined every corner and every niche and fetish were covered, from Dirty Woody to Fat Iron Man! We couldn’t help but find ourselves sucked into the madness, and the kids had an absolute blast interacting with their favorite characters. 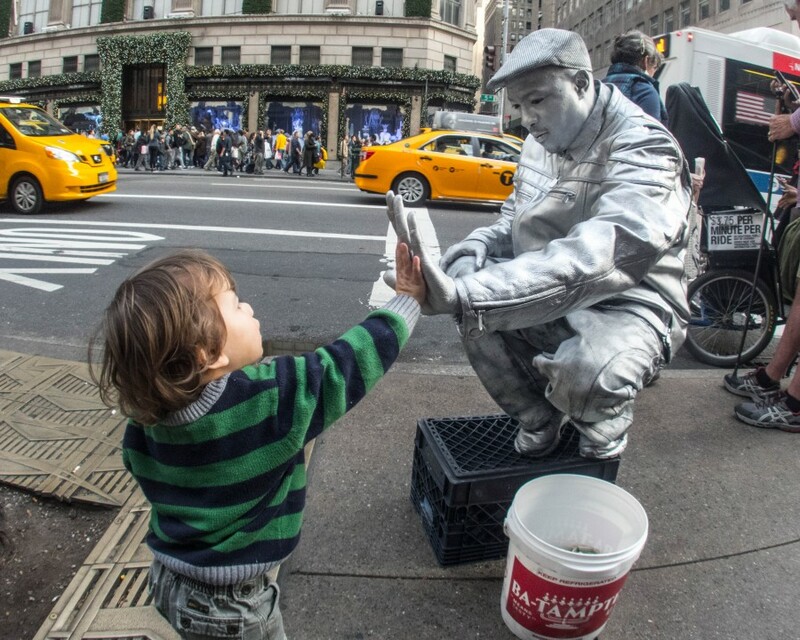 Tip: Street performers are doing their best to eek out a living doing what they’re doing. It’s OK to walk past and not take part, but if you take a photo of them or with them, make sure you drop them some cash to say thank-you. 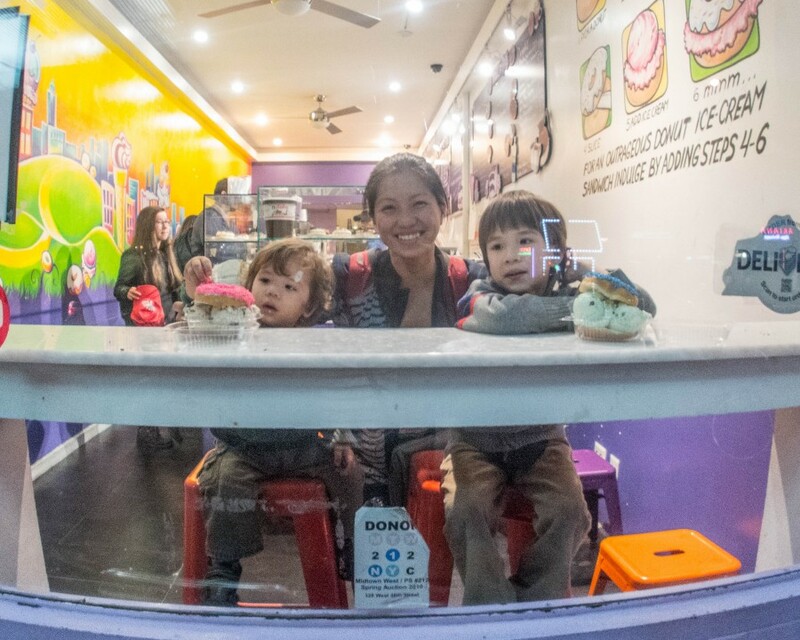 After getting to know Spanish Elmo, Dirty Woody and Fat Iron Man, we made our way to the children’s second destination on their foodie tour: Holy Cream. Located in Hell’s Kitchen at 9th Ave between west 52nd and 53rd, this quirky bakery is hard to miss with its flashing pink sign. The narrow storefront has a very limited seating area (about 4 comfortably) by the front window and they also had a couple of chairs outside. 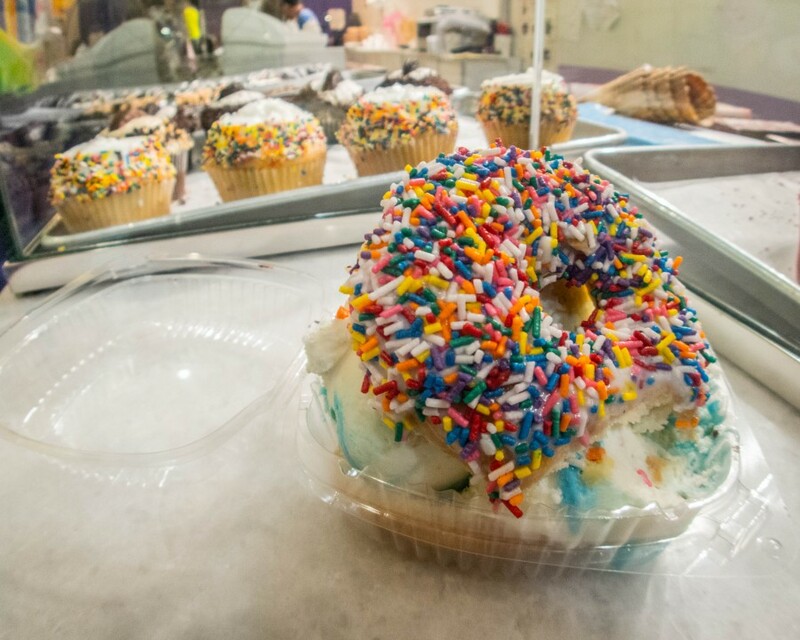 Holey Cream is home to the build your own doughnut ice cream sandwich. Rules on how to order the house speciality can be found on the wall by the front entrance. First, you pick your doughnut, next your icing and doughnut toppings and last, your ice cream flavor. For those that live in the city, they also deliver! At $7.75 per doughnut sandwich, they were definitely pricey. The kids and I though could have easily shared one between the three of us. Although at the time, there was no way of convincing them of this. Going to Holey Cream was definitely a gastronomic highlight for the children. Kevin, who did his best to ensure there were no leftovers, was barely standing by the end of it. Feeling a strong need to walk our way out of a diabetic coma, we spent the next few hours exploring parts of midtown, Greenwich Village, Soho, and Chinatown. Tip: Besides Central Park, New York City is to home to other beautiful green spaces that offer lots of room for kids to run around and often there are special free activities going on. From midtown to Chinatown you can pass by Bryant Park, Gramercy Park, and Washington Square Park. There are fountains, sculptures, and in the summer, they are like outdoor botanical gardens. 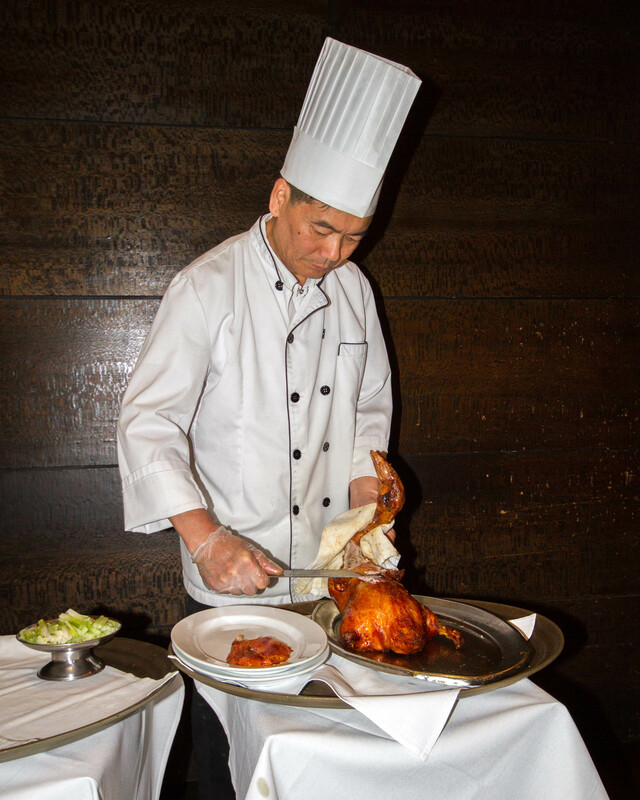 During our visit to New York’s Chinatown, we made our way to Peking Duck House on Mott street. 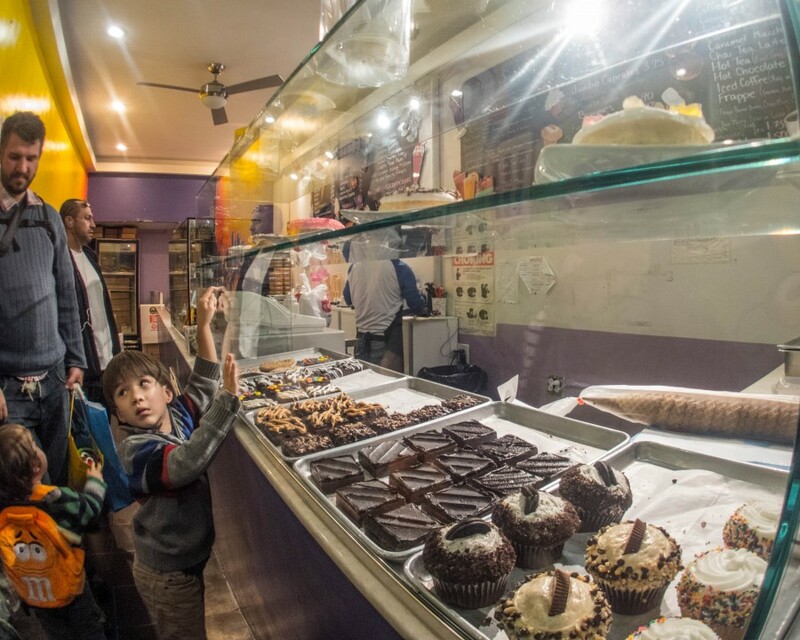 The last request on our kids’ New York foodie tour. The Peking Duck House has been a Mott street fixture for over two decades and is famous among locals so it’s a good idea to make a reservation, especially for larger parties. Peking Duck House is rated by Zagat as one of best restaurants in New York City’s Chinatown and is a regular stop for us on our journeys into the city. There is a set menu available but we always go for the duck which is served moist and is quite tasty. The kids watched intently as the chef carved the duck in front of them. Their plates were ready with duck, a pita-like wrap, hoisin sauce and sliced spring onion, all the ingredients to make your very own “duck pita”. At $57/duck it is not cheap. But one duck is more than enough for a family of four. Full and exhausted after a day of food and adventure, we left Peking Duck House and headed for the closest subway station. But on our way to the station, we were intrigued by a street vendor who was selling name art he was making on the spot. Always a softy for souvenirs, we purchased one each for C and D with the plan of mounting it above their rooms at home. Watching this man and his incredibly calligraphy was mesmerizing, it was a great end to our first kid planned itinerary! 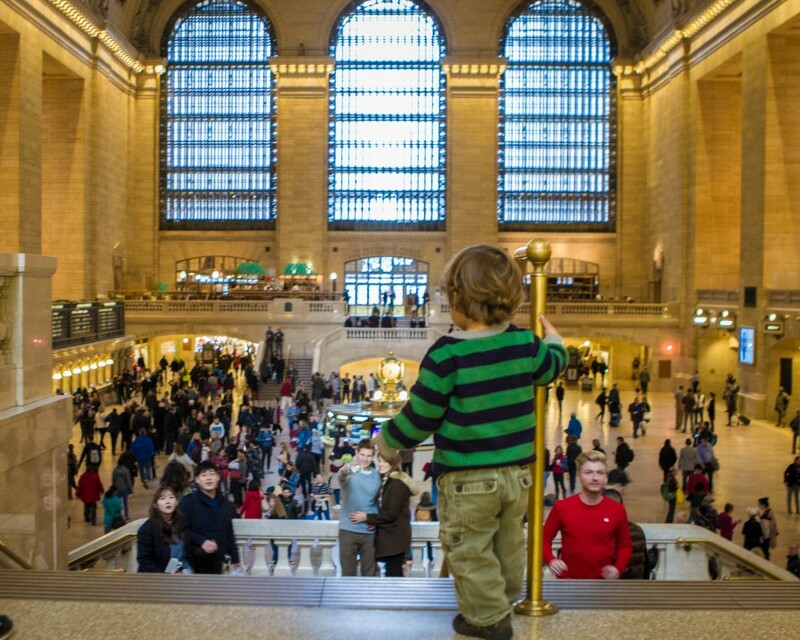 No matter what brings you to New York City with kids or solo, there are countless experiences just waiting to be had. Whether you want to explore Brooklyn, SoHo, or head out to the boroughs, New York has an adventure for everyone! You might also be interested in our Toronto Kensington Market Food Tour. Empire State Building: Admire the views from the top of the city in one of New York’s most classic high-rises. It can get windy up top, so if you are visiting during the summer, bring a sweater or a light jacket. Stop for a moment at the 9-11 memorial: This place is powerful. Explore the museum and relive the moments that made the world stop on September 11, 2001. Take in Lady Liberty from Battery Park: Battery Park offers the best views of the Statue of Liberty from Manhattan. But it’s still pretty far away so bring some binoculars. This beautiful park is always full of entertainers too, so bring some change to donate. Take a tour of the United Nations campus: The U.N. headquarters in New York City is beautiful. It also houses a great cafe. But getting in can take a while thanks to the airport-style security. There are thousands of great hotels in NYC. So if you are looking for a great place to stay in Manhattan it is sometimes best to narrow it down to the area that you’re staying in. We like to book through Booking.com when we are in the city, so this tool might help you find the best hotel at the best rates. That calligraphy is amazing! Completely mesmerizing to watch that man work. This post made me hungry!! Loved it!! Got some great ideas for what I wanna eat whenever I get a chance to visit the city!! Great blog…. nice to see there is lots that the young ones can enjoy without breaking the bank! Haven’t made it there with ours yet but definitely on the wish list. As we are from a smaller town ours also love the novelty of catching buses / tubes /trains and just watching the buzz of the city! This is awesome! The food in NYC was something pretty special – I spent most of my time there eating! Did you go to Cold Stone Creamery? $57 dollar for a duck, now that’s a fancy request from a kid! HAHA glad to hear you all had fun. They seemed to have enjoyed this foodie trip. What a fun read! I like your writing style, it’s like I was right there with you guys…you are intrepid to venture into NYC with kids though! I went once with my boyfriend at the time and I was totally overwhelmed. The name art is incredible! The calligraphy was gorgeous! What a fun food tour, sure hope this wasn’t the last- the kids made good choices. My go to dessert in New York is from Junior’s, the red velvet cheesecake was the best I’ve ever eaten. I still dream of the cupcakes from Magnolia as well! Thanks for the tips! Two places we’ll be checking out the next time we go! I don’t think I would mind taking your kids’ suggestions at all! Sounds like a fun and satisfying day to me! Heard about so much good things when it comes to the food scene of NYC! Thanks for sharing! Gotta do the hot dog stand, right?! Great picks! We’re going to have to try Holy Cream! I was just in New York again this week. Sad I missed Holy Cream – next time!! I tried Rosemary’s in the West Village this trip. Amazing!! I like it that you strive to expose your kids to lots of cultures. Because that breeds tolerance! I was in New York two months ago and this is so nostalgic! I absolutely love street food and those hot dogs were the best. I actually found a cheaper stand. They were selling hot dogs for $1! I’m just sad I didn’t have the opportunity to go to Holy Cream. Everything looks delicious! $1 for a New York dog is a great deal! Care to share what corner it’s on? That donut sandwich though! It looks incredible! Were you guys able to try the confetti bagels? I’m not sure exactly where they are, but I’ve heard they’re all the rage! Unfortunately not! We’ve heard of them though, and they look like fun! I definitely want to check out Holy Cream next time I’m in NYC. That would be a hit even with my big kids. If you enjoy Hungarian pastries, there’s a great shop across from St. John’s Cathedral. I don’t remember the name, but it’s really close. I think The hotdog stand is very popular in NY. Did you know that even our president here in the Philippines eat there. Hehehe. I would love to visit new york too someday! $57 for a peking duck! 🙂 Haha ohhh… but I did love the Holey cream though. Doughnut ice cream sandwich? What amazing mind thought up that? Now we must return to New York! The metrocard tip is brilliant and seriously the best way to save money in NYC. Good or poor planning will see you on the subway more than you think. What a mouth watering post, loved it and it made me hungry 🙂 liked your tip about the street performers, one definitely needs to spare a thought for them. Holey Fun for sure. The pictures have got me craving right now . Looks like a great time! Our kids would have picked the same kind of places. We are going to NYC later this year and I’ll bookmark this post for reference. Thanks! LOVE NYC street food. Looks like you had a super time! Holy Cream looks like heaven! First I would stare, then I would have a hard time to pick the flavors for my doughnut. It is pricey but I would at least try it once! Thank you for this great post! 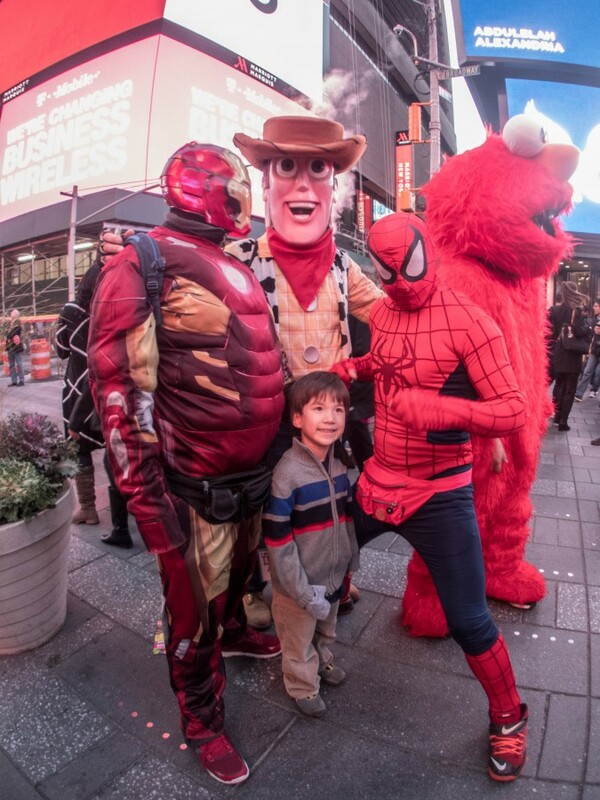 The characters at Time Square is fun to take photos with! Awesome! Thanks for sharing! I’m not sure I would have picked the same foodie sites, but I love that you let the kids do it. I have to agree that Peking Duck is amazing. I’ll be heading to NYC this summer and I’m REALLY happy I found this post! Definitely bookmarking, thanks for sharing. YUM! What could be better than exploring NYC whilst feasting on hot dogs, donuts and Peking duck! It’s awesome to indulge your inner child every now and again! Great recommendations on here! I’m ashamed that I didn’t visit any of them despite spending a foodie week in NY. Definitely have to go back – that ice cream and donut contraption is calling my name! New York City has such great food! I must admit though, when I was there I was mostly obsessed with eating at different pizza joints lol! As a New Yorker i sort of cringe when people hold up street-vendors hot dogs as iconic city food. People eat them because they’re cheap, convenient and filling they’re pretty awful! I prefer the Grey’s Papaya and its many imitators. The hot dogs are grilled rather sitting in tepid water, so they have more snap. Glad you discovered Peking Duck though; it’s really amazing! To me the must-have food that local NYers live on is pizza by the slice. it’s what i lived on when i was pregnant! We got lucky, these ones were grilled, not boiled. Unfortunately we weren’t close to a Grey’s Papaya, but I agree, their dogs are fantastic! I’ve been to New York city 3 times and have never eaten a hot dog! I really need to go back and try one! Great stuff! Your kids have taste 😉 Just left the City a few days ago after 2 weeks there. We hit a few awesome restaurants in the village. Thanks for sharing! I live in NY – I need to check out that donut place! Now I want to go to New York just so I can visit that Holey Cream place – it sounds amazing! I have always wanted to see what the pizza is like in New York, I would love to do a pizza tour!